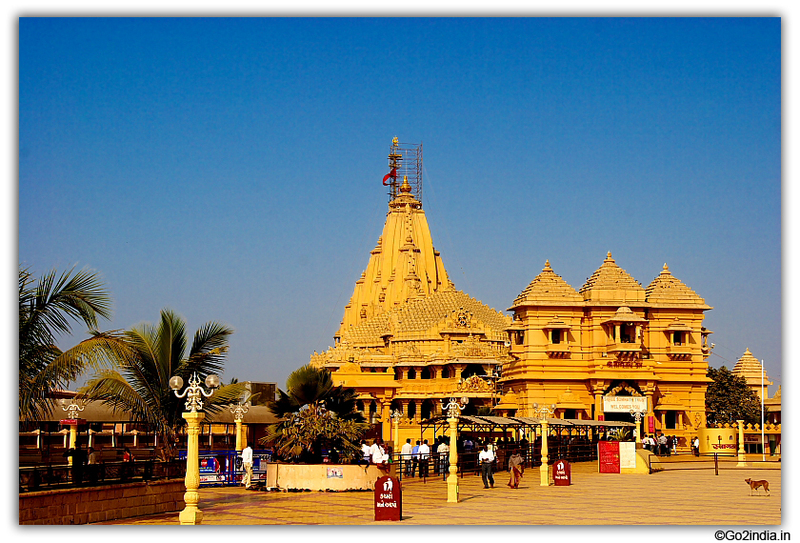 Lord Krishna temple at Dwarka is the main temple located at the Sangam of Gomti river. Dwarak is one of the four holy pilgrim place known as Char Dham of Hindu mythology. Hotel and guest hours are available near the temple. You can walk to the temple through narrow lanes with shops at both side of the road. Following items are not allowed inside the temple. Free stalls are available to deposit these items at the entrance of the temple. Take a holy dip at Gomti river before going for Darshan of Lord Krishna at Dwaraka. The main Dwarkadhish temple opens in morning 6.30 AM with Mangal Arati, and remains open ( with intermittent closures for short duration ) till 1 PM. From 1 PM to 5 PM temple is close. From 5 PM till night 9.30 PM temple remains open. 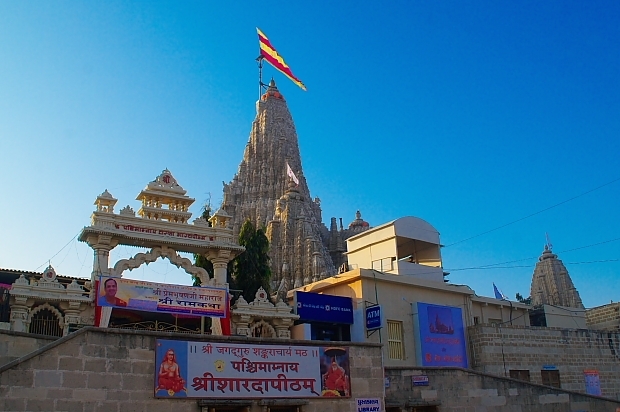 This small town is located on Dwarka � Jamnagar state highway. There are overnight sleeper bus from Ahmedabad to Dwarka. These buses will reach around 8 AM. All buses starts from Paldi in Ahmedabad upto night 11 PM. By rail it is on broad gauge line connecting Ahmedabad to Okha ( port ). Dwaraka is before 30 KM from Okha terminus point. There are several trains starts from Okha and you can start your return journey from Okha or from Dwaraka. 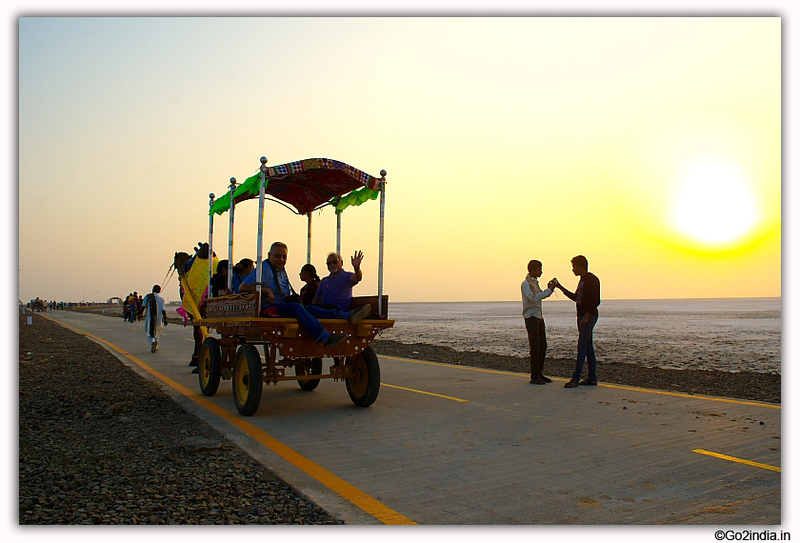 All parts of western Gujarat has sun set point where you can watch sunset in Arabian sea. This point is near the lighthouse of the beach. You can walk from Gomti Ghat to the sunset point. 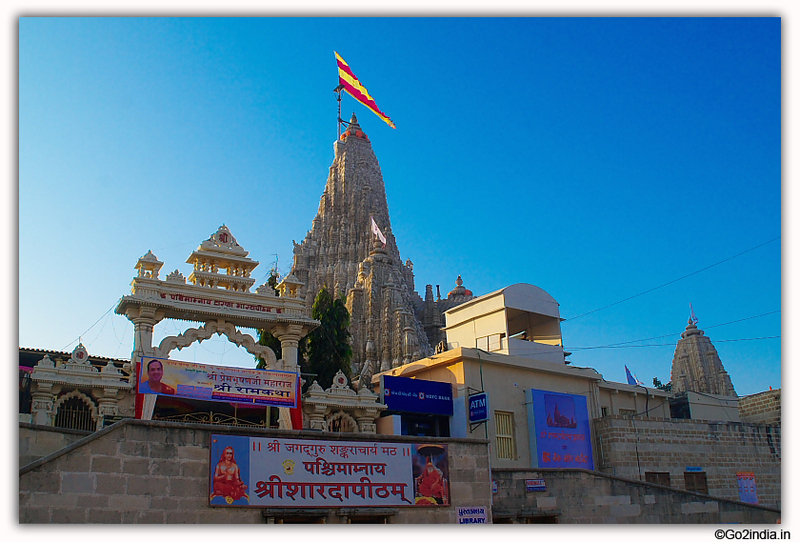 Dwarka is not a big town but there are plenty of hotels , Dharamshalas available for all type of devotees. Almost all hotels are within 500 meter to 2 KM distance from temple. If you are preferring to stay near temple then best location is to stay at Gomti ghat area where you can get good view of temple and river. Little away from busy temple area (1.5 KM ) near the lighthouse some luxury hotels are there. Here you can see sunset from your room and stay peacefully. Local Pilgrim places and other temples around Dwaraka. There are four places to visit other than the main temple at Dwaraka. Close to Dwaraka City and by the side of Helipad and National Highway this temple is of Rukmini Devi, the chief queen of Lord Krishna. Here drinking water is offered as donation to the temple. By paying different denomination of rupees you can contribute towards charges occurred for bringing drinking water to this area. As per the legend saga Durvasa once invited by Krishna and his wife Rukmini for dinner. 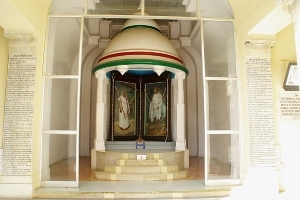 Durvasa rishi was coming by a chariot pulled by Krishna and his wife Rukmini. On the way Devi Rukmini asked for drinking water and Lord Krishna provided by hitting ground by his toe. Devi Rukmini first drank the water without offering to Durvasa , this has insulted the saga and he cursed her that she would live separately from her husband. That is the reason in this temple Rukmini is being worshiped alone without lord Krishna. As a result of this in this area there is always shortage of drinking water as groundwater is very saline here. This is one of the twelve Jyotirlinga of Lord Shiva. The big statue of Shiva is constructed by T � Series owner Sri Gulshan Kumar. This temple is almost between Beyt Dwarka and Dwarka town. At a distance of 5 KM from Nageshwar temple is the Gopi Talav , a small pond where Gopis or young girls of Dwarka merged inside. The soil is yellow in color and offered as Gopi Chandan. 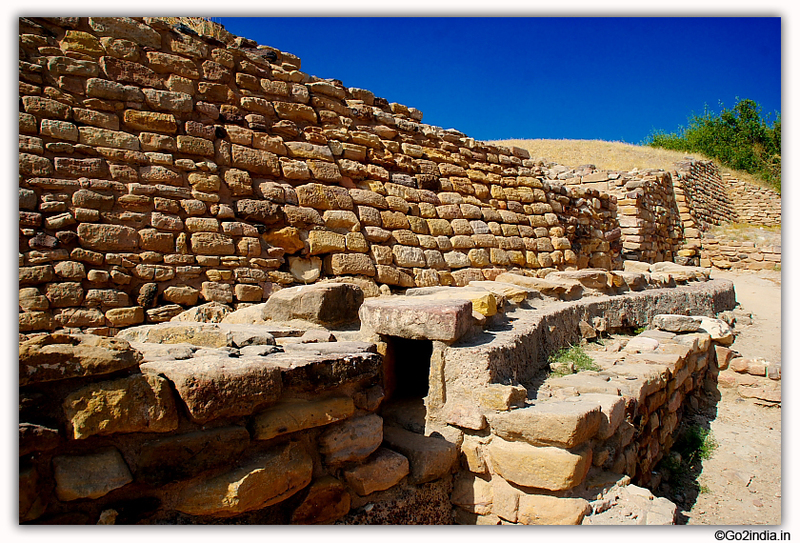 Bet � Dwarka is an island surrounded by sea from all sides. Boat service is available between Okha and Bet-Dwarka. Okha Jetty is 30 KM from Dwarka , reach here by road and then take 15 minutes lunch journey by sea to reach Bet Dwarka. There is no ticket counter and you just need to seat on the boat. The journey will start once the boat is full and the journey will take 15 minutes in sea. The boatman will collect Rs 10/- from you. 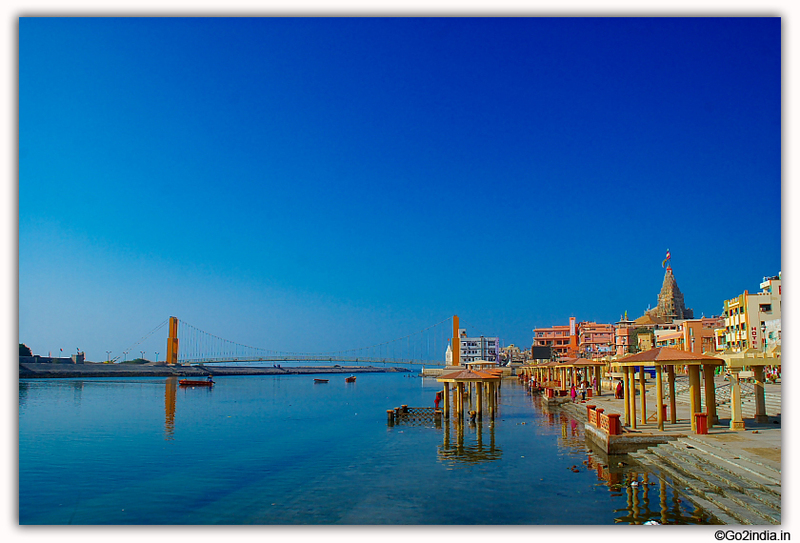 After getting down at the jetty at Bet Dwarka , you need to walk for nearly 700 meters to reach Lord Krishna temple. Hand pulled Trolley is available to take elderly persons upto the 500 meters from Jetty. From here if required Auto � Taxi available to take you to doorstep of temple. However you can easily walk to the temple by 15 minutes. Before entering to the temple you can deposit your shoes , cameras and Mobile phones at the counter. 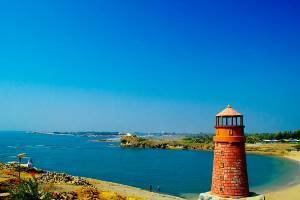 Bet - Dwarka is considered at residence of Lord Krishna. 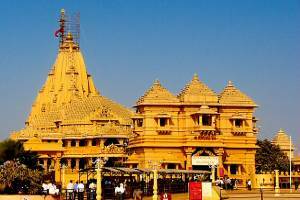 It will take 2 hours from Okha parking area to travel in sea and return to Okha after visiting Bet � Dwarka temple. By road to Dwarka will take 45 minutes ( 30 KM ). Two times in a day bus starts from Sabzi Mandi ( Vegetable Market ) near Temple for local sightseeing covering four places. Morning trip starts at 8 AM and returns afternoon 1 PM. 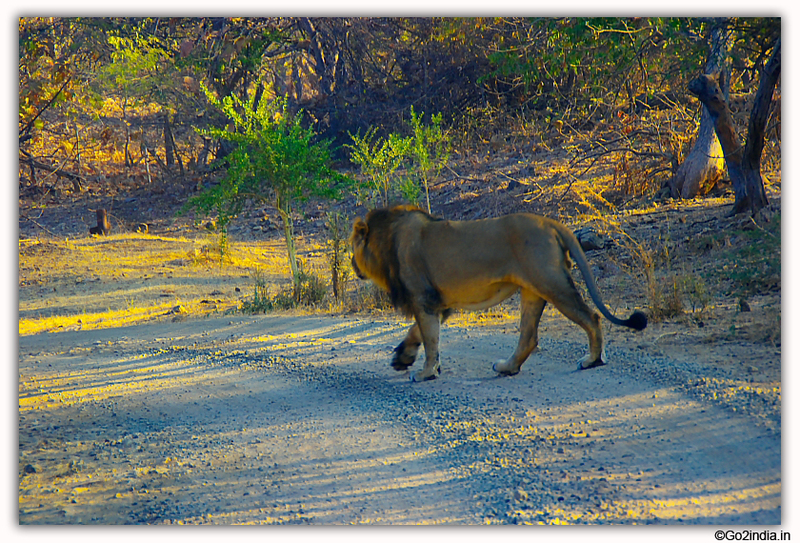 Evening trip starts at 2 PM and returns around 7.45 PM. Ticket cost is Rs 80/- per head . There are private and local body run ( semi �govt ) buses. Ticket cost is same for both but you will have better service in government run bus. Quality of buses are better for govt buses. Take your ticket from Subzi Mandi office and avoid private bus operators. Private bus services may delay return trip and be careful if you have to catch bus or train after the trip. You can hire half day taxi to cover all four points. It will start from morning 8 to afternoon 1.30 or from 2.00 PM to 7.00 PM. This matches with the opening and closing timings of the temple. During our trip to Gujarat our taxi driver Mr Lalchand picked up us from Dwarka and took us to Somnath, Diu, Gir , Junagadh and dropped us at Ahmedabad. He was our tour guide and helped us in planning our trip. He is a nice gentleman and highly cooperative. He is not very good at English , Hindi is fine. Note : go2india.in has no business connection with Mr Lalchand and will not take any responsibility on behalf of him. 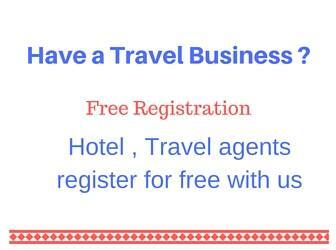 nice information..... specially for those who are visiting the places places 1st time. I pleased to receive nice information for planning to visit holy places very soon. Those who are not accustomed with ferry services may find difficult. Awesome. Thank you so much for the information. Such a clear, colourfull and easy to understand information will help me to visit the holy places.Thanx a lot.